Amitabh Harivansh Bachchan 11 October 1942) is an Indian film actor. He first gained popularity in the early 1970s as the "angry young man" of Hindi cinema, and has since appeared in over 180 Indian films in a career spanning more than four decades. Bachchan is widely regarded as one of the greatest and most influential actors in the history of Indian cinema. So total was his dominance of the movie scene in the 1970s and 1980s that the late French director Francois Truffaut called him a "one-man industry”. Bachchan went on to become the second and last superstar of Bollywood. No actor has seen the superstardom which was enjoyed by Rajesh Khanna and Bachchan. Bachchan has won numerous major awards in his career, including three National Film Awards as Best Actor he shares with Mammootty and Kamal Hassan, a number of awards at international film festivals and award ceremonies and fourteen Filmfare Awards. He is the most-nominated performer in any major acting category at Filmfare, with 37 nominations overall. In addition to acting, Bachchan has worked as a playback singer, film producer and television presenter. He also had a stint in politics in the 1980s. The Government of India honoured him with the Padma Shri in 1984 and the Padma Bhushan in 2001 for his contributions towards the arts. 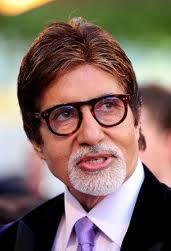 Bachchan was born in Allahabad, Uttar Pradesh, in north central India. His father, Harivansh Rai Bachchan, was a Hindi poet and his mother, Teji Bachchan, was a Sikh from Faisalabad (now in Pakistan). Bachchan was initially named Inquilaab, inspired from the phrase made famous during the Indian independence struggle, Inquilab Zindabad, which means "long live revolution". However, at the suggestion of fellow poet Sumitranandan Pant, Harivansh Rai changed the name to Amitabh which means, "the light that would never go off." Though his surname was Shrivastava, his father had adopted the pen-name Bachchan (meaning "child-like" in colloquial Hindi), under which he published all his works. It is with this last name that Amitabh debuted in films, and, for all public purposes, it has become the surname of all members of his family. Bachchan's father died in 2003 and his mother in 2007. Amitabh is the elder of Harivansh Rai Bachchan's two sons, the second being Ajitabh. His mother had a keen interest in theatre and had been offered a role in a film, but preferred her domestic duties. She had some degree of influence in Bachchan's choice of career because she always insisted that he should take the centre stage. Bachchan is married to actress Jaya Bhaduri. They have two children, Shweta Nanda and Abhishek Bachchan. Abhishek is also an actor and is married to actress Aishwarya Rai. Bachchan made his film debut in 1969 as a voice narrator in Mrinal Sen's National Award winning film Bhuvan Shome Thereafter he got his first acting role as one of the seven protagonists in Saat Hindustani, a film directed by Khwaja Ahmad Abbas and featuring Utpal Dutt, Madhu and Jalal Agha. Though the film was not a financial success, Bachchan won his first National Film Award for Best Newcomer. Anand (1971) followed, where he starred alongside Rajesh Khanna. Bachchan's role as a doctor with a cynical view of life garned him his first Filmfare Best Supporting Actor Award. He then played his first negative role as an infatuated lover-turned-murderer in Parwaana (1971). This was followed by several films including Reshma Aur Shera (1971). During this time, he made a guest appearance in the film Guddi which starred his future wife Jaya Bhaduri. He narrated part of the film Bawarchi. In 1972, he made an appearance in the road action comedy Bombay to Goa, directed by S. Ramanathan. Many of his films during this early period did not do well, but that was about to change. Director Prakash Mehra cast him in the leading role for the film Zanjeer (1973) as Inspector Vijay Khanna. The film was a sharp contrast to the romantically themed films that had generally preceded it and established Amitabh in a new persona—the "angry young man" of Bollywood cinema. Filmfare considers this one of the iconic performances of Bollywood history. The film was a huge success and one of the highest grossing films of that year, breaking Bachchan's dry spell at the box office and making him a star. From then onwards, Bachchan became one of the most successful leading men of the film industry. He earned his first Filmfare nomination for Best Actor for Zanjeer. The year 1973 was also when he married Jaya, and around this time they appeared in several films together; not only in Zanjeer but in films such as Abhimaan which followed and was released only a month after their marriage and was also successful at the box office. Later, Bachchan played the role of Vikram, once again along with Rajesh Khanna, in the film Namak Haraam, a social drama directed by Hrishikesh Mukherjee and scripted by Biresh Chatterjee addressing themes of friendship. His supporting role won him his second Filmfare Best Supporting Actor Award. In 1974, Bachchan made several guest appearances in films such as Kunwara Baap and Dost, before playing a supporting role in Roti Kapda Aur Makaan. The film, directed and written by Manoj Kumar, addressed themes of honesty in the face of oppression and financial and emotional hardship and was the top earning film of 1974. Bachchan then played the leading role in film Majboor, released on 6 December 1974, which was a remake of the Hollywood film Zig Zag. The film was a success at the box office. Two of his other releases that year viz. Kasauti and Benaam also made money making his success at the box office consistent. In 1975, he starred in a variety of film genres from the comedy Chupke Chupke along with Dharmendra, the crime drama Faraar to the romantic drama Mili. 1975 was the year when he appeared in two films which are regarded as important in Hindi cinematic history. He starred in the Yash Chopra directed film Deewaar, opposite Shashi Kapoor, Nirupa Roy, and Neetu Singh, which earned him a Filmfare Nomination for Best Actor. The film became a major hit at the box office in 1975, ranking in at number 4. Indiatimes Movies ranks Deewaar amongst the Top 25 Must See Bollywood Films. Released on 15 August 1975 was Sholay along with Dharmendra, which became the highest grossing film of 1975 and also of all time in India, earning INR 2,36,45,00,000 equivalent to US$ 60 million, after adjusting for inflation. Bachchan played the role of Jaidev. In 1999, BBC India declared it the "Film of the Millennium" and like Deewar, has been cited by Indiatimes movies as amongst the Top 25 Must See Bollywood Films. In that same year, the judges of the 50th annual Filmfare Awards awarded it with the special distinction award called Filmfare Best Film of 50 Years. Bachchan starred in comedies such as Chupke Chupke (1975) and Amar Akbar Anthony (1977) and in films such as Kabhie Kabhie (1976). In 1976, he was once again cast by director Yash Chopra in his second film, Kabhi Kabhie, a romantic tale in which Bachchan starred as a young poet named Amit Malhotra who falls deeply in love with a beautiful young girl named Pooja played by actress Raakhee. The film was notable for portraying Bachchan as a romantic hero, a far cry from his "angry young man" roles like Zanjeer and Deewar. The film evoked a favourable response from critics and audiences alike. Bachchan was again nominated for the Filmfare Best Actor Award for his role in the film. In 1977, he won his first Filmfare Best Actor Award for his performance in Amar Akbar Anthony where he played the third lead opposite Vinod Khanna and Rishi Kapoor as Anthony Gonsalves. The film was the highest grossing film of that year. His other successes that year include Parvarish, Khoon Pasina and Adalat.He once again resumed double roles in films such as Kasme Vaade as Amit and Shankar and Don playing the characters of Don, a leader of an underworld gang and his look alike Vijay. His performance won him his second Filmfare Best Actor Award. He also gave towering performances in Trishul and Muqaddar Ka Sikandar both of which earned him further Filmfare Best Actor nominations. In 1979, Bachchan starred in Suhaag which was the highest earning film of that year. In the same year he also enjoyed critical acclaim and commercial success with films like Mr. Natwarlal and Kaala Patthar. Amitabh was required to use his singing voice for the first time in a song from the film Mr. Natwarlal in which he starred alongside Rekha. His performance in the film saw him nominated for both the Filmfare Best Actor Award and the Filmfare Best Male Playback Awards. In 1979, he also received Best Actor nomination for Kaala Patthar (1979) and then went on to be nominated again in 1980 for the Raj Khosla directed film Dostana, in which he starred opposite Shatrughan Sinha and Zeenat Aman. Dostana proved to be the top grossing film of 1980. In 1981, he starred in Yash Chopra's melodrama film Silsila, where he starred alongside his wife Jaya and Rekha. Other successful films of this period include Ram Balram (1980) which also starred Dharmendra, Shaan (1980), Lawaaris (1981), and Shakti (1982) which pitted him against legendary actor Dilip Kumar. On 26 July 1982, while filming Coolie in the University Campus in Bangalore, Bachchan suffered a near fatal intestinal injury during the filming of a fight scene with co-actor Puneet Issar.Bachchan was performing his own stunts in the film and one scene required him to fall onto a table and then on the ground. However as he jumped towards the table, the corner of the table struck his abdomen, resulting in a splenic rupture from which he lost a significant amount of blood. He required an emergency splenectomy and remained critically ill in hospital for many months, at times close to death. The public response included prayers in temples and offers to sacrifice limbs to save him, while later, there were long queues of well-wishing fans outside the hospital where he was recuperating. Nevertheless, he spent many months recovering and resumed filming later that year after a long period of recuperation. The film was released in 1983, and partly due to the huge publicity of Bachchan's accident, the film was a box office success and the top grossing film that year. Later, he was diagnosed with Myasthenia gravis. His illness made him feel weak both mentally and physically and he decided to quit films and venture into politics. At this time he became pessimistic, expressing concern with how a new film would be received and stated before every release, "Yeh film to flop hogi!" ("This film will flop"). In 1984, Bachchan took a break from acting and briefly entered politics in support of long-time family friend, Rajiv Gandhi. He contested Allahabad's seat of 8th Lok Sabha against H. N. Bahuguna, former Chief Minister of Uttar Pradesh and won by one of the highest victory margins in general election history (68.2% of the vote). His political career, however, was short-lived: he resigned after three years, calling politics a cesspool. The resignation followed the implication of Bachchan and his brother in the "Bofors scandal" by a newspaper, which he vowed to take to court. Bachchan was eventually found not guilty of involvement in the ordeal. His old friend, Amar Singh, helped him during a financial crisis due to the failure of his company ABCL. Therefore Bachchan started to support Amar Singh's political party, the Samajwadi party. Jaya Bachchan joined the Samajwadi Party and became a Rajya Sabha member. Bachchan has continued to do favors for the Samajwadi party, including advertisements and political campaigns. These activities have recently gotten him into trouble again in the Indian courts for false claims after a previous incident of submission of legal papers by him, stating that he is a farmer. A 15 year press ban against Bachchan was imposed during his peak acting years by Stardust and some of the other film magazines. In his own defense, Bachchan claimed to have banned the press from entering his sets until late 1989. In 2000, Bachchan hosted India's adaptation of the British television game show, Who Wants to Be a Millionaire? entitled, Kaun Banega Crorepati. As it did in most other countries where it was adopted, the program found immediate success. He has hosted all but one of the seasons of the show. Canara Bank withdrew its law suit against Bachchan in November 2000. Bachchan hosted KBC till November 2005, when he fell ill. At that time he was admitted to Lilavati Hospital's ICU once more, to undergo surgery for diverticulitis of the small intestine. During the period and that following his recovery, most of his projects were put on hold, including KBC. The show's success set the stage for his return to film popularity. In 2009 Oscar winning movie Slumdog Millionaire in the first question of Who Wants to be a Millionaire? contest "Amitabh Bachchan" was the correct answer to the question "Who was the star of Zanjeer? Feroz Abbas Khan performed as Amitabh Bachchan in a scene in the movie while Anil Kapoor performed as the host of the contest. Bachchan hosted the third season of the reality show Bigg Boss in 2009. Amitabh Bachchan was in the news in 2011 for the wrong reasons. He was accused by certain members of the Sikh community of instigating attacks on Sikhs during the 1984 anti-Sikh riots. The attacks followed the assassination of Indira Gandhi post Operation Blue Star. He is alleged to have made polemic remarks saying “Khoon ka Badla Khoon se lenge” ( “Blood for Blood”). Several eyewitness have claimed that he made such remarks and wrote to the Akal Takht asking for action against Mr. Bachchan. Responding to the allegations, Mr Bachchan is said to have written to the Akal Takht,which is the highest temporal body of the Sikhs, pleading his innocence. The Akal Takht has not taken a decision yet exonerating Mr Bachchan of the charges Following the controversy, few members of the Sikh community protested by chanting slogans against Mr Bachchan as he carried the Olympic torch during the 2012 Summer Olympics in London. Apart from National Film Awards, Filmfare Awards and other competitive awards which Bachchan won for his performances throughout the years, he has been awarded several honours for his achievements in the Indian film industry. In 1991, he became the first artist to receive the Filmfare Lifetime Achievement Award, which was established in the name of Raj Kapoor. Bachchan was crowned as Superstar of the Millennium in 2000 at the Filmfare Awards. The Government of India awarded him with the Padma Shri in 1984 and the Padma Bhushan in 2001 France's highest civilian honour, the Knight of the Legion of Honour, was conferred upon him by the French Government in 2007 for his "exceptional career in the world of cinema and beyond". In 2011, actor Dilip Kumar blogged that Black should have been nominated for an Oscar. Kumar added: "If any Indian actor, in my personal opinion, deserves the world's most coveted award, it is you." In 1999, Bachchan was voted the "greatest star of stage or screen" in a BBC Your Millenium online poll. The organisation noted that "Many people in the western world will not have heard of [him] ...[but it] is a reflection of the huge popularity of Indian films. "In 2001, he was honoured with the Actor of the Century award at the Alexandria International Film Festival in Egypt in recognition of his contribution to the world of cinema. Many other honours for his achievements were conferred upon him at several International Film Festivals, including the Lifetime Achievement Award at the 2010 Asian Film Awards. In June 2000, he became the first living Asian to have been modelled in wax at London's Madame Tussauds Wax Museum.Another statue was installed in New York in 2009,Hong Kong in 2011, Bangkok in 2011 and Washington, DC in 2012. In 2003, he was conferred with the Honorary Citizenship of the French town of DeauvilleHe was honoured with an Honorary Doctorate by the University of Jhansi, India, in 2004, the University of Delhi in 2006, the De Montfort University in Leicester, UK, in 2006, the Leeds Metropolitan University in Yorkshire, UK, in 2007, and the Queensland University of Technology in Brisbane, Australia, in 2011. On 27 July 2012, Bachchan carried the Olympic torch during the last leg of its relay in London's Southwark. Severals books have been written about Bachchan. Amitabh Bachchan: the Legend was published in 1999, To be or not to be: Amitabh Bachchan in 2004, AB: The Legend: (A Photographer's Tribute) in 2006 , Amitabh Bachchan: Ek Jeevit Kimvadanti in 2006, Amitabh: The Making of a Superstar in 2006, Looking for the Big B: Bollywood, Bachchan and Me in 2007 and Bachchanalia in 2009. Bachchan himself also wrote a book in 2002: Soul Curry for you and me – An Empowering Philosophy That Can Enrich Your Life. In the early 80s, Bachchan authorized the use of his likeness for the comic book character Supremo in a series titled The Adventures of Amitabh Bachchan.